oil business came to a screeching halt. We closed the business and just held the property. to convert from a machine and fab shop to an indoor & outdoor flea market. 400 outside table, all outdoor flea market tables are under cover and on concrete. Our Flea Market has about 6 acres of customer parking, handicap & motorcycle parking area. where anyone can come and feel safe and have fun. We have 2 Montgomery County Police Officers on duty; we allow no alcohol or guns on premises. We welcome anyone who wants to spend the day looking at almost anything you can imagine or not imagine. 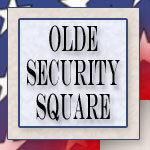 Looking forward to seeing you at OLDE SECURITY SQUARE FLEA MARKET!